In a 17th-century manuscript made up mostly of hagiographic material (discussed briefly here) from the Church of the Forty Martyrs (Mardin, no. 256), I have come across a letter attributed to Severos of Antioch (d. 538), a well known figure in Syriac literature, especially to those interested in the theological literature of christological controversy. The letter is titled, The Letter Sent by Mar Severos, Patriarch of Antioch, when He Was Banished by the Wicked Chalcedonians. 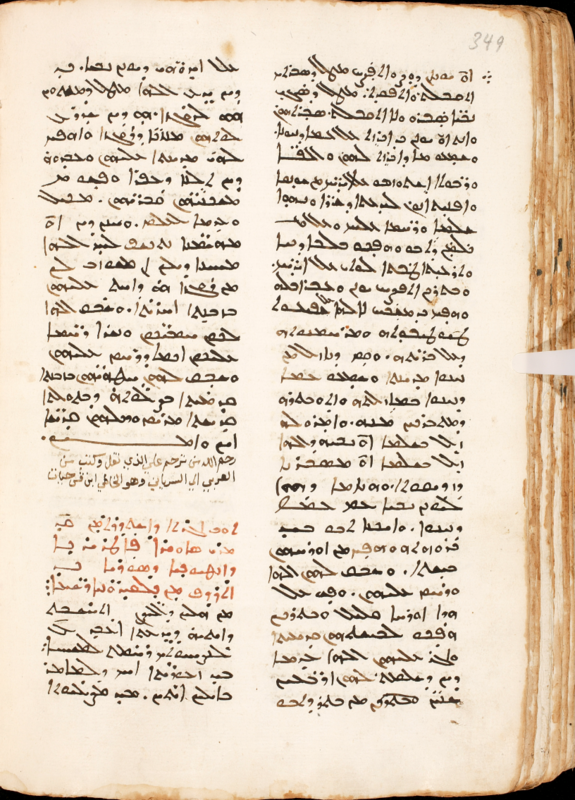 Severos wrote in Greek, in which language but little of his work survives, while a very notable corpus consisting of homilies, hymns, letters, and theological works survives in Syriac translation. Most of the letters surviving in Syriac — themselves still but a small part of Severos’ whole epistolary oeuvre of more than 3800 (!) letters — were published and translated by Brooks in the early twentieth century (see the bibliography). Arthur Vööbus in 1975 brought attention to another letter, the very one I have just met in the Mardin manuscript, two pages of which I supply below; Vööbus also points to a few other manuscripts with the letter (cf. plate 11 at the end of the Vööbus Festschrift, ed. R.H. Fischer [Chicago, 1977], for one from Damascus) and a brief discussion of the manuscript settings in which the letter has been transmitted. I point out this letter (and Vööbus’ article), not only because, as far as I know, the letter still remains unpublished and because of its uniqueness and significance, but also because subsequent scholarship on Severos seems to have taken little notice of it. Finally, it should be noted that there is an Arabic (Garšūnī) version of the letter in the big manuscript from Saint Mark’s Monastery, Jerusalem, no. 199 (ff. 524v-526v acc. 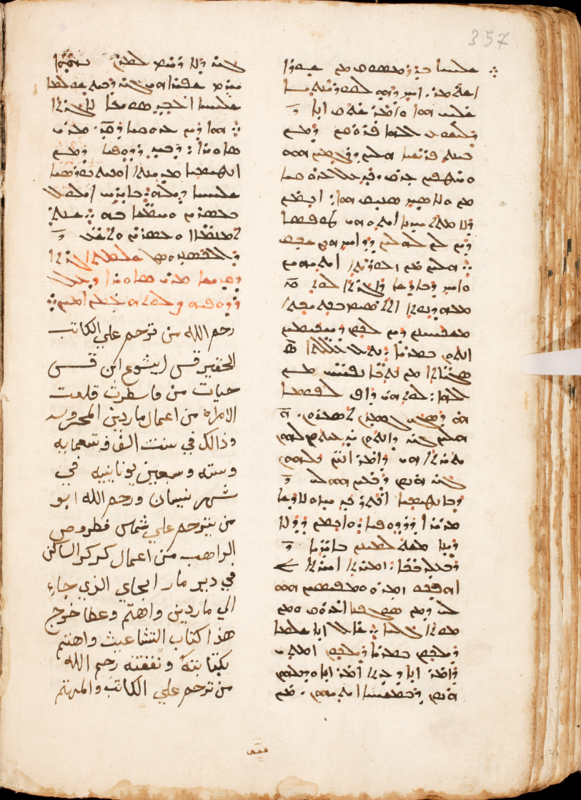 to the foliation with Syriac letters); a scan of a microfilm of this manuscript — also chiefly of hagiographic content — is available here as SMC 3-2 and 3-3, but full-color images of the manuscript and the rest of the Saint Mark’s collection (about 300 mss) will soon be accessible through HMML. Pauline Allen and C.T.R. Hayward, Severus of Antioch (London and New York, 2004). S.P. Brock, “Severos of Antioch,” in Sebastian Brock, Aaron Butts, George Kiraz, and Lucas Van Rompay, eds., Gorgias Encyclopedic Dictionary of the Syriac Heritage (Piscataway, 2011). ——–, “Some New Letters of the Patriarch Severos,” in Studia Patristica XII (Berlin, 1975), pp. 17-24. E.W. Brooks, A Collection of Letters of Severus of Antioch, PO 12.2 (1915) and 14.1 (1920). ——–, The Sixth Book of the Select Letters of Severus Patriarch of Antioch in the Syriac Version of Athanasius of Nisibis, 2 vols. (London, 1902-1904). CPG III, nos. 7022-7081, esp. 7070.11.